In stock -This product will ship today if ordered within the next 2 hours and 25 minutes. 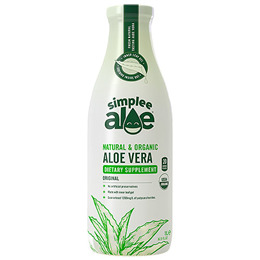 Introducing Simplee Aloe`s original 100% natural and organic Aloe Vera. They handpick their Aloe Vera leaves and only use the inner leaf gel of the plant, and no bitter outer rind. 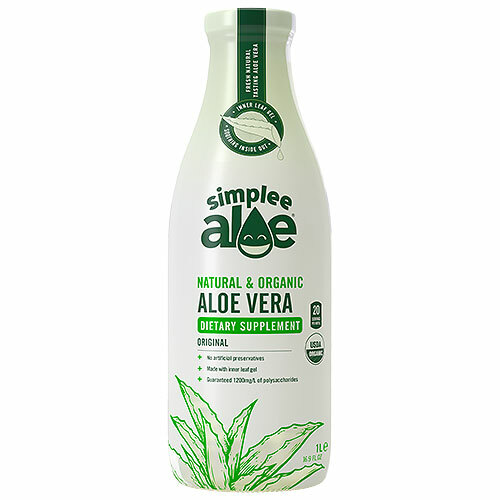 Simplee Aloe`s organic aloe vera is cultivated from sustainable farms where we carefully hand select the highest organic grade aloe vera leaves from mature plants. They never add any artificial preservatives such as potassium sorbate or citric acid. For Adults: Recommended adults take 3-6 tablespoons (50-100ml) per day before food. For Children: Recommended children take 2 tablespoons (30ml) per day. Once opened, please keep refrigerated and consume within 3 weeks of opening. This aloe contains natural ingredients and you may find variations in colour and taste, please shake well before drinking. Below are reviews of Simplee Aloe Organic Aloe Vera Juice Original - 1 Litre by bodykind customers. If you have tried this product we'd love to hear what you think so please leave a review.